It turns out I’m not the only one trying to create Thanksgiving-centric junk food. 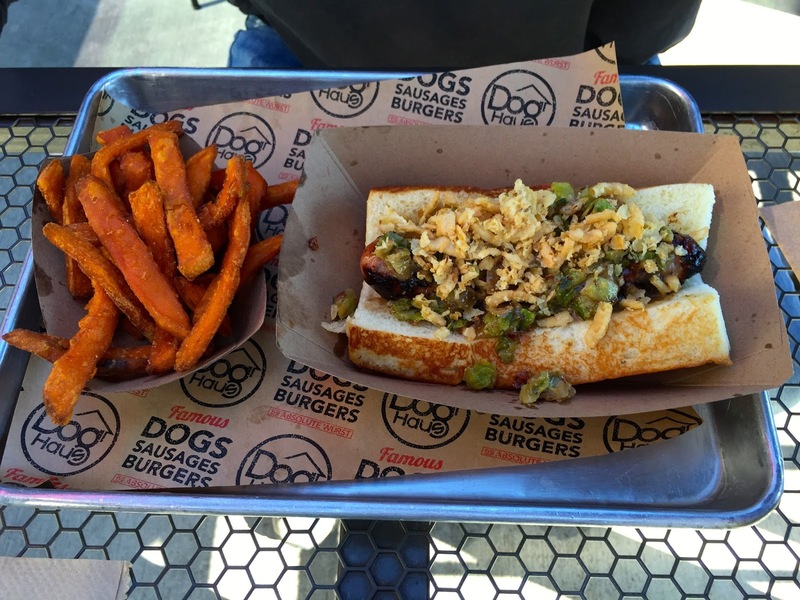 The Southern California hot dog restaurant chain Dog Haus is offering a Turducken dog complete with Thanksgiving-ish trimings. If you haven’t had the pleasure, turducken is a dish consisting of a chicken stuffed into a duck stuffed into a turkey. On the plus side, that’s like a magic trick. Someone should yell, “Ta da!” when it’s served and the napkins should be pulled in an endless chain from the waiter’s sleeve. On the negative side, though, the name “turducken” starts with the word “turd”. A food has to taste pretty good to overcome that. Anyway, apparently plain old turkey wasn’t fancy enough for a company that calls themselves a “craft” hot dog stand on their very own website and named themselves “Dog Haus” because their limited time Thanksgiving hot dog features a sausage made from this Russian nesting dolls of a poultry dish. To the bird-in-bird-in-bird mix Dog Haus added Thanksgiving table staples sweet potatoes and cranberries and blended it all up into a sausage. Then they put that sucker on a King’s Hawaiian roll and topped it with sage gravy, roasted Brussels sprout & bacon slaw and crispy fried onions then they served it with a side of sweet potato fries. The Turducken dog is pretty good and it does taste something like Turkey Day. I loved the crispy onions, the sprout slaw was nice and the pops of sweet from the cranberry in the sausage were great. The biggest surprise for me, though, was the King’s Hawaiian Roll. Every hot dog should come on one of those. So I sat outside on an 80 degree late November afternoon and ate a fancypants Turducken hot dog. Yep. That’s feels like an L.A. Thanksgiving to me.